Are you looking for the right soap making oil? Browse through the list to determine the best choice(s) for you. For detailed information, about each oil, click on the links provided. Discover origins, benefits, saponification values, (KOH & NaOH), soap making supplies and other useful information! Find quick soaping tips! See a saponification chart for more information. All the best to you in your soap making endeavors! ALMOND OIL: Low, stable, creamy, lather. Add 10% wheat germ oil to extend life. Shelf life 4 - 6 months. APRICOT KERNEL OIL: Use for superfatting. Light in texture. Similar to almond oil in its acid fatty makeup. Luxury conditioning oil at 5% - 10% in soap recipes. AVOCADO OIL: Good Base Oil. Superfatting. Stable, creamy, lather with small bubbles. BABASSU OIL: Carrier oil. Often used as substitute for Coconut oil. Very little scent. BEEF TALLOW: Gives super hard, white, bar of soap. Low, creamy, lather. Common oil used for making soap. Recommend to use no more than 40% in soap recipes. Combines well with coconut or olive oils. Also called, “sodium tallowate”. CAMELLIA OIL: Provides high lather. Use 2% - 10% in soap recipes. Light texture. Sweet, herbal, scent. CANOLA OIL: Substitute for olive oil. Low, creamy, lather. Slows rate of trace. CASTOR OIL: Offers cream, bubbly, lather. Use at low percentage, no more than 5% - 10% of total weight of oils. High amounts can produce a soft or sticky bar of soap. Popular soap making oil! COCOA BUTTER: Stable vegetable fat. Has chocolate scent. Adds rich creamy texture. COCONUT OIL: Adds hardness to soap. Adds rich creamy texture. Generates natural bubbly lather. Popular soap making oil! CORN OIL: Moisturizing, stable, lather. Use up to 10% - 15% in soap recipes. Not widely used. Can have side affects for those with corn allergies. COTTONSEED OIL: Not widely used. Crisco and most shortenings are blends of cottonseed and soybean oils. Offers creamy lather. Has poor reputation due to heavy pesticides used on cotton crops. EMU OIL: Not widely used. Luxury oil for making soap. Mostly used in cosmetics, balms, lotions. FLAXSEED OIL: Can make orange spots in soap. Fragile oil, can go rancid quickly. Use alone or combine with other oils. Soothe dry skin by combining with calendula oil and mango butter. GRAPE SEED OIL: Good conditioning additive. Use up to 5% in soap recipes. Too much makes soft soap bar. GRAPEFRUIT SEED OIL: Can accelerate trace and react with fragrances. May cause soap to seize. Natural preservative. Prevents rancidity. Gives soap a longer shelf life. HEMP SEED OIL: Light, silky, creamy lather. Short shelf life, less than 6 months. Use up to 10% - 15% in soap recipes. JOJOBA OIL: A liquid wax. Stable creamy lather. Long shelf life, 2 - 4 years. Speeds up rate of trace. Use at 5% - 10%, maximum, in soap recipes. KUKUI OIL: Add rich, creamy, lather. Can be expensive. Use up to 10% in soap recipes. LARD: Makes very hard, white, bar of soap. Offers low, creamy, lather. Main fat used for soap making. Combines well with liquid oils; coconut or olive. Economical. Use fresh, high quality, lard. Spoiled lard has bacon, greasy, scent. Use no more than 30% - 40% in soap recipes. MACADAMIA NUT OIL: Exotic oil. Produces stable, conditioning, lather. Use at small percentage in soap recipes. MANGO BUTTER: Emollient. Recommend use up to 15% of total base oils in soap recipes. Use for superfatting. High in unsaponifiables. NEEM OIL: Strong, earthy, nutty, scent. Growing in popularity for making soap. Antiseptic, anti-fungal, insect repelling. OLIVE OIL: Base oil. Makes hard bar. Makes dense lather, combined with other oils. Most soap makers use pure, refined or grade A olive oil. Others prefer less expensive pomace olive oil. Virgin or Grade A oils are lighter in color, producing lighter colored soap. The green color of Pomace olive oil may come through the finished soap product. Pomace olive oil can speed up the time to get to trace. All grades of olive oil have similar fatty acid makeup, so each makes similar bars of soap. Popular soap making oil! OLIVE LEAF OIL: Often used in conjunction with regular olive oil. Olive leaf powder is a natural warm brown colorant in soap. Heavy in texture. PALM OIL: Gives hard bar and rich, creamy, lather. Combines well with oils; olive, coconut, castor. Currently, concerns exist about palm oil farming in Malaysia, with effects on economy and rain forests. PALM KERNEL OIL: Popular soap making oil. Offers hard, white, bar of soap with good lather. Can use up to 30% - 35% soap recipes. Like Palm Oil, it currently has world economy and environmental concerns. PUMPKIN SEED OIL: Stable, creamy, lather. Similar to soybean or sunflower oil in hardness, lather and conditioning. Considered luxury oil compared to basic oils. Use sparingly in soap recipes. RED PALM OIL: Produces hard bar. Produces stable lather. Can stain clothes or soap molds. Use up to only 5% in soap recipes. Blends well with coconut, olive, palm kernel oils. RICE BRAN OIL: Similar qualities to olive oil, but less expensive. Gives soap a waxy, shiny, finish. Offers creamy, silky, lather. Blend with coconut oil to add hardness. Popular soap making oil! SAFFLOWER OIL: Moisturizing and conditioning. Use only as a portion, 5% - 15% in soap recipes. Combine with carrier oil, with good antioxidants, for extended shelf life. SESAME SEED OIL: Slightly thick in texture. Moisturizing. Conditioning. Has slight oily feel. If used at high percentage in soap recipes, scent must be controlled. 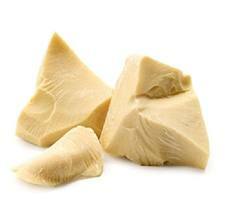 SHEA BUTTER: Typically used 5% - 7% in soap recipes. Melts at body temperature. Has nutty scent. SHEA OIL: Luxury oil for making soap. This liquid oil really gives no benefits to soap. Use actual shea butter, instead. SOY OIL: A neutral filler oil. Combine with coconut or olive oil for stable, bubbly, lather. Use only as portion, 5% - 10% in soap recipes. Otherwise, if used alone, will produce a soft, gritty, slimy bar soap. SUNFLOWER OIL: Use in conjunction with saturated oils. Use up to 10% - 20% in soap recipes. Makes a soft bar. Causes soap to slowly reach trace and harden. WALNUT OIL: Produces stable, creamy, lather. Makes soap slow to trace. Combine with other oils, high in saturated fats. For hard bar, blend with coconut oil or cocoa butter. Use sparingly in soap recipes. WHEAT GERM OIL: Offers stable, conditioning, lather. Use as small percentage of base oils. Use for superfatting at trace, Add to soap recipes after hard oils have melted. Use 3% - 12% in soap recipes. Ultra refined wheat germ oil has slight, nutty, aroma. Find soap making supplies and suppliers. Learn how to make soap. SOAP MAKING OIL AT AMAZON!